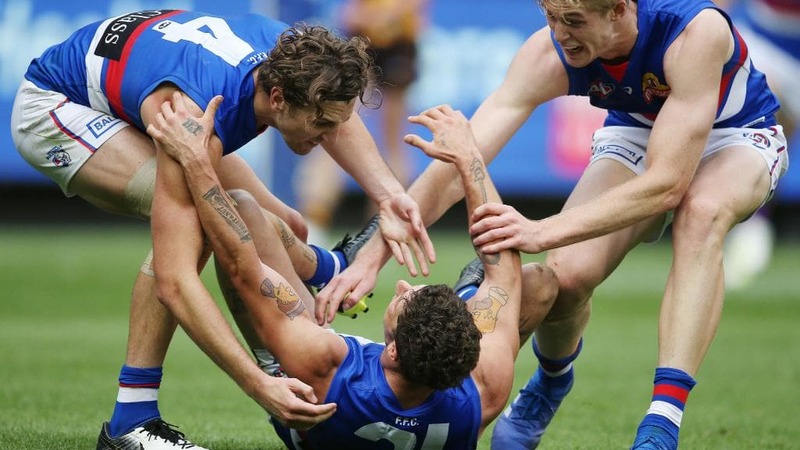 A photograph taken on Sunday, after Tom Liberatore kicked the “sealer’’ against Hawthorn at the MCG, is symbolic of what Libba means to his Bulldog teammates. Sprawled on the ground, arms thrust in the air, he is set upon by teammates; Marcus Bontempelli’s eyes piercing with adulation. It happens after most goals in a tight game, but this was different. This was Libba. At 26, he’s back from a second knee reconstruction. That alone is a story of resilience and a love of the game, and, he said, a love for the people he represented. He won a flag in 2016, supposedly partied like it was 1999, and for a time was the poster boy for football from another time: free-spirited and carefree. But he said that perception, of his character and behaviour, was a problem for other people. “I think the people who think I’m different don’t know me,’’ he said. He seemed to have avoided the media in his eight-year career, or the Bulldogs have shielded him from it, so it was a surprise he fronted several media outlets at Doggies headquarters on Tuesday. Most of the chat was about his knee, his mentality and his form in the first two rounds. The best chat was about Liberatore the person, a largely unknown entity to those outside the football club. Internally, an endearing tenderness is reserved for Libba. “He’s the heart and soul of a football club, the glue who joins people together but who also inspires,’’ chief executive Ameet Bains said. He described Libba as *!“engaging, thoughtful and charismatic’’. Liberatore said footy and fun was not about having an ability to click one off and the other on when the occasion presented. “I don’t think it’s ever been about serious and fun, it’s been about focusing on what’s good for me and what’s not,’’ he said. Unlike his first knee op, the second knee op didn’t send him to dark places. While his teammates laboured in a mediocre season, Libba laboured in rehab and prospered elsewhere. With a mate, he’s set up an app called Busket which helps the buskers in the city, underpinning his desire to help the homeless of Melbourne. “There’s around 110,000 to 115,000 who don’t have a home to go back to at night,” he said. He also studied creative writing at RMIT. “I’ve enjoyed poetry, I’ve enjoyed screenwriting, and I want to tie it in with social work,’’ he said. Throughout was a desire to return to football, and when asked what football meant to him, he said: “I was actually thinking about this the other day, and my mates ask me from time to time. “Football for me is … you know, everyone plays for themselves, it’s part of what they do. For me, it’s more getting the best out of myself for other people. I play for my mum, my dad, my brother. Have you grown to respect the game? “I’ve never abused it, it’s just more about learning and growth. Being able to realise what it means to me,’’ he said. He came back to a changed environment in 2019. The youngsters are older and bigger, there are new recruits, and, of course, departing mates such as Luke Dahlhaus. “Initially it was sad, but that’s a selfish point of view, I guess, because he’s my mate,’’ Libba said. And retiring teammates, such as Liam Picken? What had not changed — and certainly was missed — was Liberatore’s game-day energy; from his talk and encouragement to harassing opposition players, by bump or rustling of their hair. “I bring that energy and bring that enjoyment and bring that sense of positive energy towards us and negative energy towards them,’’ he said. “I just do anything I can to make it easier for my teammates, that’s why I do it. After two rounds, the enthusiastic and swarming Bulldogs are 2-0, and Liberatore is hunting and gathering in a midfield of plenty. For a bloke back from a second knee, it can’t get better. “I think we’re playing with a bit more freedom now, just naturally because of our form … and because we started well, you get that extra boost of freedom,’’ he said. Some thoughtful answers there that fly in the face of likely public perception of him. Very good article. Great hearing positive news about Libba. He is back! Last edited by Eastdog; 03-04-2019 at 05:39 PM. Who is playing VFL that could be in our firsts? Exciting article and thanks for posting. Look in the Libba thread, I posted one. I’ve gotten 2 over the journey. The Statue of Liberatore is my fave. I hope they have his permission and he is getting something out of it. I bought a Libba beanie & T short combo. The girl working the door at the comedy festival last night was wearing one and against the Suns a guy was talking about how much he loves the beanie. The colours of the beanie look a bit washed out. Can confirm this - the blue is way more sky blue. It's a small beanie too - I like the New Era beanies, the Libba beanie is way tighter & thinner on your head.